I was just thinking of this book this morning while playing with Riley. 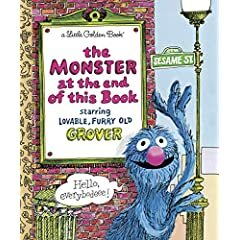 For those who don’t know the story, Grover spends the book trying to convince the reader not to turn to the next page, because that brings us closer to the end of the book and as the title states, there is a MONSTER *gasp* at the end of the book! There are wonderful drawings of Grover pleading, nailing up boards, building brick walls, and pages where he laments about how you have continued to turn the pages despite his warnings. I go back to work next Tuesday. This week has just flown by. I’ve often felt like Grover- in my mind pleading and hoping that someone would somehow keep the day from turning into the next day. Like in the story, there’s no stopping the inevitable. I woke up and realized today is Friday. Where did this last week go?! My head is in a panic- this is the last day we’ll have just for the two of us. This is the last day we’ll have to spend running errands during the day together. The last chance we’ll get to meet Daddy for lunch. The last time we’ll get to watch the Today Show together and Regis and Kelly. The last day we’ll get to spend playing together. The last day I get to be a “SAHM” (stay at home mom). My heart gets caught in my throat thinking about it. And then I realize I’ve spent this time thinking about it when we could be doing something wonderful and get even more disappointed in myself and upset. I completely understand Grover’s panic and fear and desperation on the page right before the end. When he tells the reader that the next page is it. The next page will bring The Monster! He tries one more time but has given up because the reader has turned the page before, they’re going to turn it again. I know that no matter what I do or think or say, tomorrow is going to come too. Here’s where the book teaches a very important lesson. When we turn the page, there is no “MONSTER”. Grover looks around and realizes that the monster at the end of the book is him. He is the monster at the end of the book! I find it a perfect analogy for my life right now. My return to work is the monster at the end of this chapter of my life. I don’t look forward to it because it takes me away from the Rilester and I question if daycare will be good for her and if I’m just being selfish about continuing in my career. There are many reasons why I am going back to work and I know day care will be good for her. It is an excellent center and close to my office so I can pop over at lunch or be there in an instant if she needs me. And like Grover I find myself calm now, and like Grover on the very last page of the book- I too feel a bit embarrassed that I’m so worried at all. However, unlike Grover, I’m a mom. I’m finding that being worried, questioning my choices, and realizing there is no single perfect answer are all part of this life. I’m also luckier than Grover- because instead of invisible readers who don’t listen to me, I’ve got Mark who does listen and understands, is always here for me and is also figuring out this whole parenting thing himself. So today we’ll play, we’ll run some errands, we’ll have bottles and we’ll enjoy the lovely day it is outside. We’ll have this weekend with Dad and we’ll look to next week like the new adventure it is. Next Tuesday will just be the beginning of a new routine, not something to fear or try to delay further. 2 Responses to "The big change at the end of this month…"
WOW! turn that over and you have MOM! You have made the transformation from a woman with a child to a mother with a daughter! Welcome to the most awe inspiring job there is! Step back and read that entry you just wrote…you are doing and will continue to do a great job! It will be hard at first but hang in there. Mark and Riley are very lucky and blessed to have you in their lives!